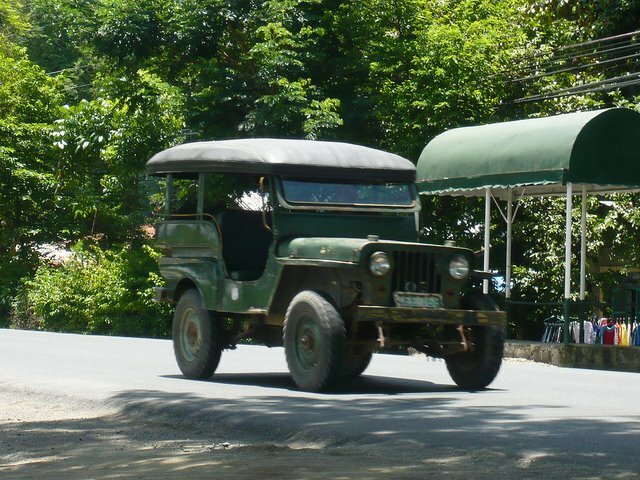 When the US began reducing their military presence in the Philippines at the end of World War 2, they surplused a lot of Willys jeeps. Enterprising Filipinos began extending the length of these and turning them into local people haulers. True to the Filipino spirit, they didn't stop there but kept embellishing and decorating them in an infinite variety of ways. 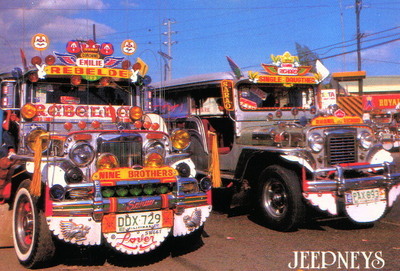 A writer once said: "The Jeepney is a mobile assemblage of signs, and symbols, decorative motifs and fetishes, rattling along the streets of Metro Manila and other towns throughout the archipelago with a 'Whoopie' that would astonish the designers of the Original Willys' Jeep." 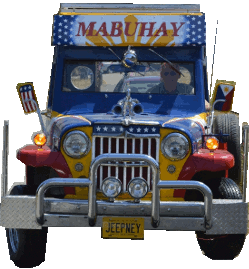 The supply of surplus jeeps ran out long ago, but the Filipinos kept making their jeepneys, building them now from scratch but keeping the same basic shapes. This has only changed recently with competition from the "Jumbo Jeepney" - one you can actually stand up in, and the e-Jeepney powered by electric motors.